A Kotobukiya Japanese import! Kotobukiya’s line of beautiful Bishoujo statues has brought you amazing characters reimagined in the Japanese “pretty girl” style for years, and now it’s expanding to a very familiar property, Metal Gear Solid! The first Metal Gear Solid game was released on PlayStation in 1998 and featured stealth action as directed by Hideo Kojima. A massive commercial success, “MGS” has gone on to include sequels and stories told through several other media. Presented like you’ve never seen her before and based on a new character illustration by Shunya Yamashita is Sniper Wolf! An enemy of Solid Snake and member of the evil FOXHOUND, Sniper Wolf first appeared in the original Metal Gear Solid game. Now she’s captured taking a rest from her overwatch duties, reclining on a crate with one foot resting on an ammo container. The elite markswoman is of course never without her weapon, and so she gently holds her sniper rifle in front of her with one hand. 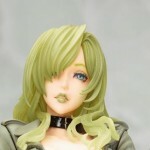 Sniper Wolf wears her iconic customized green and black uniform that’s open at the chest and her yellow/green hair flows down around her beautiful Bishoujo-styled face (with blue eyes and green lipstick) that looks at you like you’re a target. From her clothing to her rifle and the crate beneath her every element of this statue is intricately sculpted and highly detailed. There’s even a wolf pup peeking out from its hiding spot inside the broken crate! Sculpted by Takaboku Busujima (BUSUJIMAX), Sniper Wolf is 7 ½ inches tall (1/7 scale) sitting on her crate display base. Recruit her to stand guard over your collection and she’ll keep an eye on you! But not everything has curves! Also included in the assortment of Bishoujo statues was an absolutely KILLER Metal Gear Sahelanthropus, from Metal Gear Solid V: The Phantom Pain! This piece is a Plastic Model Kit and is all sorts of awesome! You can check’em all out after the break! We’ve mirrored a few images. You can check them out by reading on. Kotobukiya also released their San Diego Comic-Con 2015 Catalog. You can see the above images by reading on.